Jimmy Zhou is the 2015 ACOP Main Event Champion (HK$5,885,000)! After a heads-up match that lasted close to three hours, Zhou Zhou, also known as, Jimmy Zhou, won the Asia Championship of Poker Main Event. Zhou sealed his championship when Thomas Ward limped on the button, Zhou moved all in with the , and Ward called with the . The two players raced for all the chips, but it was Zhou who stayed ahead and won the tournament. "I want to thank my friends," Zhou said. "They've been here cheering me on all day." Zhou was heard saying he doesn't think that he will play another tournament anytime soon. "I can't handle all this excitement," he said. "I couldn't sleep last night." The day started with seven players returning to the final table. Connor Drinan was the chip leader and Zhou would eventually be the person to bust him. Earlier in the day, Zhou had doubled through Drinan when he was all in behind, but made a flush with four spades on the board to stay alive. Later, Zhou had the to eliminate Drinan, who was holding the , in fifth place. 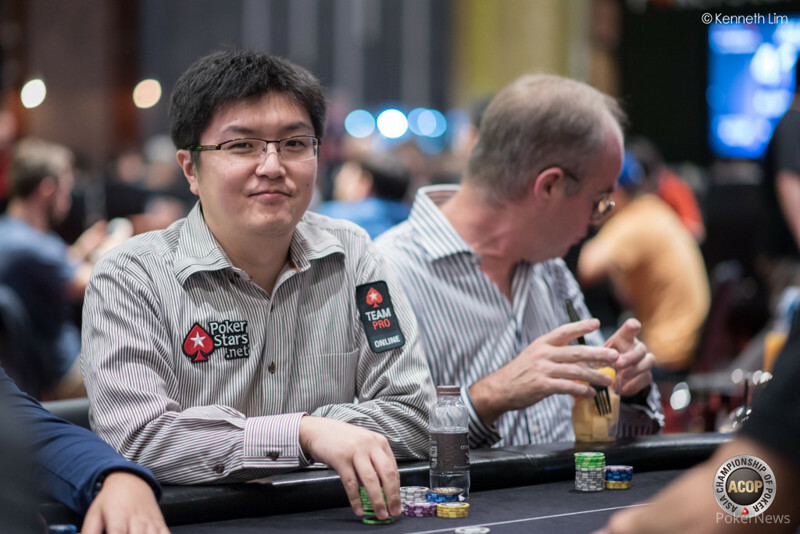 Zhou also won a critical hand when he was all in once again with and behind, but managed to stay alive and parlay his survival into an APPT title. Behind Ward, Nan Tu finished in third place. Tu got knocked out when he got all in against Ward. Tu had two pair, and Ward had an open-ended straight draw. Ward got there to eliminate Tu. Rounding out the final day was Hsien Yuan Yang in fourth place, Qi Luo in sixth, and Xixiang Luo in seventh. Tomorrow there is one more big event to play out, with the conclusion of the HK$500,000 Super High Roller taking place. Six players remain, and PokerNews will be on hand for live coverage. 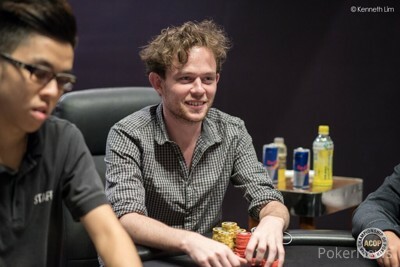 After winning the HK$250,000 High Roller earlier in the week, Phanlert Sukonthachartnant could not repeat his performance in the HK$500,000 Super High Roller. He finished as the "bubble boy," and it will be American Andy Andrejevic leading the way into Sunday's final table. 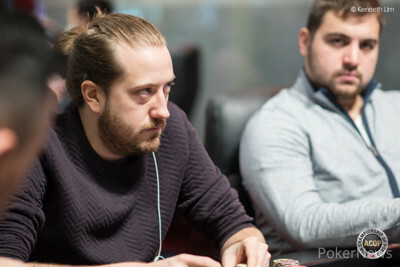 Andrejevic, who won his seat in a live satellite, bagged up 6.255 million in chips and has a slight advantage over Steve O'Dwyer in second place. Sukonthachartnant burst the bubble after a confrontation with O'Dwyer. The latter called on the button before Sukonthachartnant raised to 240,000 out of the small blind. O'Dwyer called to see a flop, where he bet 160,000 after Sukonthachartnant checked. The man from Thailand check-raised to 450,000 and then tank-called off for another 780,000 after O'Dwyer shoved. Sukonthachartnant opened the for middle pair, but he was way behind O'Dwyer's two pair with the . The and followed on the turn and river, and Sukonthachartnant was out in seventh place. The final six will return on Sunday at 2:30 p.m local time to play for the title and HK$8,725,000 first-place prize. They're all guaranteed HK$1,696,200, and PokerNews will be bring you full coverage. Zhou Zhou is the Asia Championship of Poker Main Event Champion. He eliminated Thomas Ward in a classic race. Thomas Ward limped the button, as he had done for many of the hands in the heads up match. Zhou raised all in and Ward snap called. Zhou held and Ward had . Ward had won the last three all ins, but this time he couldn't overcome the pocket fives of Zhou. The board ran out and that was it for the ACOP Main Event. 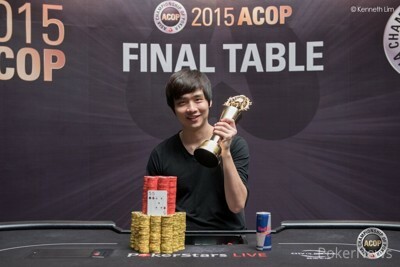 Zhou "Jimmy" Zhou is the 2015 ACOP Main Event Champion. Stay tuned for a complete recap of the action as well as more updates from the Super High-Roller bubble. Thomas Ward got the stacks back to virtually even but lost the next hand to fall behind once more. Ward bet 100,000 on a flop after no preflop raise and Zhou Zhou check-called. Both players checked the turn before Zhou led for 250,000 on the river. Ward raised to 650,000 and Zhou called. Ward confidently opened for two pair but Zhou had a better two pair with . After many of the big hands in this heads up match, there are a few quiet hands in the moments after a large pot. The last few hands have been no different. Thomas Ward limped and Zhou Zhou checked his option. This has been pretty standard from Ward all night. The flop came and both players checked. They both checked the turn, , and the river, . Zhou took down the uncontested pot with and Ward showed ten high, giving Zhou the small pot. Over the last few hands Thomas Ward has taken down a few pots with large three bets. First he shoved all in after an opening raise of 180,000 by Zhou Zhou. The second time, Ward made it 580,000 after another opening raise of 180,000 by Zhou. Just nine players remain in the Super High Roller Event and Steve O'Dwyer still leads with 5.4 million. Mustapha Kanit is still in after receiving that horrific beat earlier. John Juanda laid that beat on him and he's still in along with the likes of Bryn Kenney, Erik Seidel, Andy Andrejevic, Anton Astapau and Kitson Kho. Play will end when the bubble bursts and six players remain. Things were looking bleak for Thomas Ward as he was slowly losing chips to Zhou Zhou. On one hand, the board read and Zhou bet 300,000. Ward called and Zhou showed for two pair and won the pot. That hand left Ward with $1.7-million chips. On the next hand, Ward limped and Zhou raised to 180,000. Before Zhou finished raising, Ward had already shoved all in and Zhou's raised turned into an all in call. It was a race with Zhou holding and Ward holding . The flop looked great for Zhou when it came , but the peeled off on the turn to the applause of Ward's rail. The river was the and sealed the double for Ward. Thomas Ward looked frustrated at showdown and no wonder. The turn came out to propell him into the lead but Zhou Zhou snatched it back on the river. Ward raised to 180,000 from the button and Ward peeled before both checked the flop. Zhou then led out for 250,000 on the turn and Ward called. Both players checked the river and Ward's lost out to Zhou's .